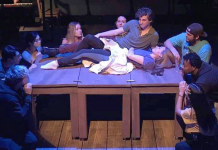 Aye mates, Grossmont College’s theatrical department has done it again with its production of “Treasure Island, A new Musical.” Its full of song, dance and a whole lot of fun for ye ole’ scallywags out there. With a script prepared from scratch, this is a forlorn tale of the treacherous hunt for Captain Flint’s bountiful treasure, but who’s on the good side is an adventure that you can only see for yeself by going to the play. Aye mates, Grossmont College’s theatrical department has done it again with its production of “Treasure Island, A new Musical.” Its full of song, dance and a whole lot of fun for ye ole’ scallywags out there. With a script prepared from scratch, this is a forlorn tale of the treacherous hunt for Captain Flint’s bountiful treasure, but who’s on the good side is an adventure that you can only see for yeself by going to the play. Or ye might be delivered a black spot, or worst yet have a mutiny on ye hands to deal with, just as Captain “Mad Morgan” Smollett (Delia Mejia). 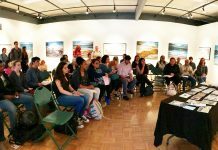 As part of the theater departments Summer Conservatory program that brings in high school students to work alongside college students and learn from professionals in the industry, this year’s production is full of surprises and talents yet to be discovered. In the quest for looking for Flint’s bountiful booty, the cast delivered a stellar performance on opening night with everyone aboard to bring ye a great night of entertainment. And that is was as the cast was spot on as they delivered musical numbers, swashbuckling fights and a lot of humor added in between. It all revolves around Jamie Hawkins, played by Ashley Carter, who is given a treasure map to Flint’s bountiful treasure by Billing Bones (Delicia Nieto) right before he was stabbed to death in her parent’s watering hole as he drank down a bottle of rum. Needing the money to help her ailing father, she goes on an adventure of a lifetime, and a her dream to see the world and find adventure finally comes true. But the young lass, posing as a young cabin boy onboard, had no clue what she had gotten herself into. Carter did a superb job in both her acting and singing, and if you watch closely, the looks on her face as things are happening are around her was a delightful entertainment in itself. She played off the other actor’s actions with precision and an uncanny timing. Mejia, or Mad Morgan as she built her reputation to be, was outstanding, never giving away whether she was on the up and up or a pirate after the booty herself. Her motley crew, hired by Dr. Livesey (Luke Benning) was a toss up whether they be pirates or not, adding much to the story as you never knew what was coming up next in the search for pirates gold. Long John Silver, the rogue captain disguising himself as a cook on the ship, despite his wooden leg giveaway, shocked the audience in his rendition of “Mutiny” when he broke out in rap so clear and concise as the rest of the cast busted out some great hip-hop moves on the stage. Along with his performance in “All Hands on Deck,” this was brilliant writing in song and added a youthful flavor to an age-old tale. Some of my favorites for the evening was Daniel Kazules, who played Port & Starboard, an uncertain pirate, or not, with a bird on his shoulder that talked for him, except in secret. His performance was intoxicatingly funny yet when he broke out in song, his smooth high baritone voice surprised the lot of us sitting in the audience. Well-done mate! Another surprising voice in the cast was Kristian Power who played Everett, then Ben Gunn, smitten by the young and beautiful Jamie Hawkins after being stranded on Skeleton Island for as long as he could remember. His performance of “Here I go Again” showcased his powerful but melodic voice as a solo and he proved that he could work alongside with the pros with “Edge of Glory,” a duet with Carter and backed up by the entire cast. Speaking of the cast, they did a tremendous job an integrating everything that this play offered. With some difficult dance moves, some great interaction with the crowd and pulling off the many musical numbers, this play is ready for ye to see. 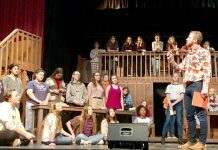 Moving away from traditional swashbuckling music, this performance intertwines relevant pop songs into the story, and again, the rap and hip-hop brings Robert Louis Stevenson’s “Treasure Island” to a new high and relevant to a younger generation without leaving the ole’ folks in the dark. And I’m not giving away the booty, you’ll have to search for it yeself by going and seeing this play that is fit for adventurers of all ages. Kudos to the co-directors Brian Rickel and Mitzi Smith and the awesome musical direction by John Reynolds, special arrangements by Jeanette Thomas, this is a world premier that you will not find anywhere else. And none of this could have been pulled off so well without the entire production staff. Props and graphics were great in creating such and adventure and the Theatre Ares faculty and staff did a phenomenal job in mentoring these students in such a challenging and exciting play. So get off your bootie and get to Stagehouse Theatre. 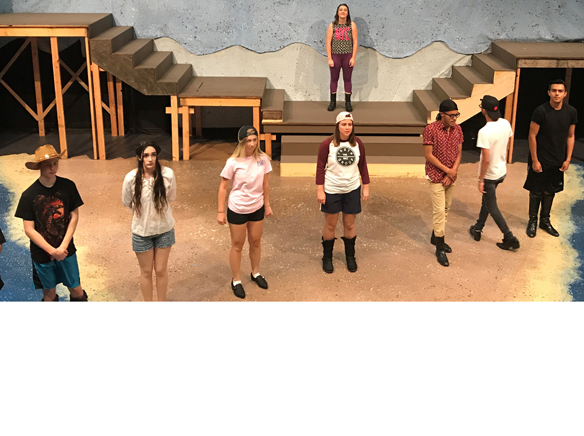 3Grossmont College Summer Arts Conservatory is one of my favorite performances that I wait for each summer, and each year, this privately funded program gets better and better. And the fact that it gives the next generations of actors a chance to work with professionals in the industry is something that I admire in the program and the professionals that take their time in mentoring these young students. But ye need to see it for yeself. And there is still time for ye to do so. “Treasure Island” is still in the house and you can see this great performance for pennies on the dollar and if you participate in its opportunity drawing, ye can walk home with a treasure chest of booty for yeself. There are two performances on Aug. 3 at 2 p.m. and 7:30 p.m. Aug. 4 at 2 p.m. and 7:30 p.m. and a closing performance on Aug. 5 at 2 p.m.
For tickets call the box office at (619) 644-7234 or visit www.grossmont.edu/academics/programs-departments/theatre/default.aspx.